"The areas where corruption has flourished are obviously shrinking." Prime Minister Volodymyr Groysman believes that the problem of corruption in Ukraine is exaggerated and is used to destabilize the situation in the country. He stated this in an interview with Forbes.Georgia, which he posted on his Facebook page on Friday. "I will be absolutely honest with you, without any sweet pills, I believe that many of our enemies are interested in destabilizing Ukraine and they always put forward the problem of corruption in our country. They keep repeating that corruption is widespread and they do it everywhere, including abroad. 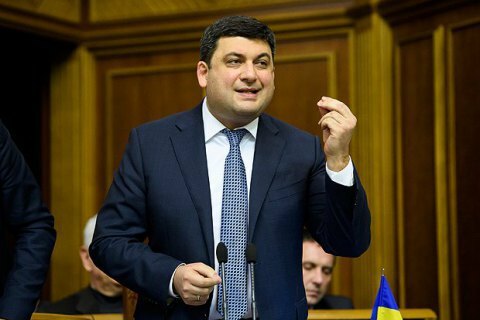 I run into this problem now and then and I think it is exaggerated," Groysman told Georgian Forbes. In his opinion, corruption has already been defeated in various areas. "The list of areas in which corruption flourished obviously reduced," Ukrainian prime minister said, "in particular in public procurements, sale of natural gas, and drug imports. "Obviously, corruption still does exist in law enforcement agencies, courts, authorities issuing permits and licenses, and in government agencies providing various services. This is why it is extremely important to ensure successful privatization. As part of the ongoing reforms, we adopted last fall the necessary privatization legislation. This means that there will be established a certain transparent system," said the prime minister. In a recent poll, 80% of Ukrainian respondents described the fight against corruption in the country as unsuccessful, while 46% believe it completely failed.